The quiver tree or Aloidendron dichotomum is probably the best known aloe found in South Africa and Namibia. Visitors to the Western Cape can see a collection of quiver trees at the Karoo Desert National Botanical Garden. 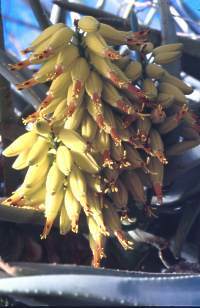 It was previously called Aloe dichotoma, but the tree aloes have recently been accorded a genus of their own. This distinctive tree aloe has smooth branches, which are covered with a thin layer of whitish powder that helps to reflect away the hot sun's rays. The bark on the trunk forms beautiful golden brown scales, but beware, the edges of these scales are razor sharp. The crown is often densely rounded as a result of the repeatedly forked branches, hence the species name dichotoma. (dichotomous meaning forked). The blue-green leaves are borne on terminal rosettes, but in juvenile plants the leaves are ranked in vertical rows. The bright yellow flowers are borne from June to July. The young flower buds can be eaten and have a similar appearance and taste to asparagus. Sugar birds are drawn to these flowers in winter where they feed on the nectar produced by the flowers. Aloidendron dichotomum is an extremely tough tree that may reach an age of over 80 years and a height of approximately 7 metres. This species is a conspicuous component of the arid parts generally known as Namaqualand and Bushmanland. It occurs in rocky areas, from near Nieuwoudtville northwards into Namibia and eastwards to Upington and Kenhardt. The earliest record of A. dichotomum was made by Simon van der Stel (Governor of the Cape at the time) on his northward journey to the Copper Mountains in 1685. His record reads, "Aloe arborescens; its trunk is sometimes 12 feet high, and it has a beautiful, clear and copious sap from which excellent gumma aloes could probably be made in large quantities. Its bark is rather hard but the pith is soft, light and spongy. The branches of the trees are used by the natives (Bushmen) as quivers for their arrows. They hollow them out and cover the one end with a piece of leather and thus skilfully make from this tree, which they call Choje, a strong and serviceable quiver. October 15th". A common phenomenon in the branches of these trees is the huge communal nest of weavers that live and breed by the thousands. Here their young and unborn are safe from predators such as snakes and jackals. Large trunks of dead trees are also hollowed out and used as a natural fridge. Water, meat and vegetables are stored inside it. The fibrous tissue of the trunk has a cooling effect as air passes through it, a so-called natural fridge. Aloidendron dichotomum features quite prominently in gardens all over South Africa and other countries with a similar climate. In wetter parts of South Africa such as the Western Cape, these plants are able to cope provided that the drainage is good enough to prevent rotting in the wet winters. A position in a hot and dry rock garden is best if one wants to grow this aloe in open ground. Plants such as Cotyledon orbiculata, Crassula rupestris, Cyphostemma juttae, and Tylecodon paniculata are special companion plants to quiver trees and will completely transform any garden. Alternatively, quiver trees can be grown in large containers. This is very rewarding as beautiful specimens can be positioned to enhance certain areas. Always use a good quality, loamy sandy soil with plenty of drainage chips at the bottom of containers. Bone meal is mixed into the soil to help feed the fleshy roots of plants. Plants can be grown from seeds planted in autumn, (March, April) in trays of coarse river sand. Truncheons can also be used for propagation. Truncheons must be dried out for at least 3 weeks before planting in river sand. This is quite a difficult alternative and success is not always guaranteed. REYNOLDS, G.W. 1950. The aloes of South Africa. Cape Times, Parow, Cape Province. VAN WYK, B-E. & SMITH, G. 1996. Guide to the aloes of South Africa. Briza Publications, Pretoria. Grace, O.M., Klopper, R., Smith, G.F., Crouch, N.R., Figueiredo, E., RØnsted, N.E. & Van Wyk, A.E. 2013. A revised generic classification for Aloe (Xanthorrhoeaceae subfam. Asphodeloideae). Phytotaxa 76,1: 7–14.